Two pet alpacas have been killed in what their owner said were "hideous and targeted" attacks. 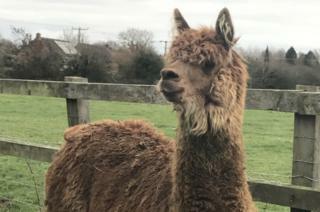 Ginger alpaca Ed Sheeran died last week when its eye was gouged out after it was drugged in a garden in Ludgershall, Buckinghamshire. Its companion Hector was disembowelled in the compound three months ago. Their owner Amanda Beaumont said she was "terrified" for her third Alpaca. Police are investigating the killings, as the Bucks Herald reported. Ms Beaumont discovered Ed in the garden on Thursday and the vet was immediately called. "She said he'd been drugged and the eye had been completely removed with a blade," she told the BBC. "The vet said it was like a surgical removal." Although the prognosis was initially good, Ed died "probably from the shock", said his owner. "I think they drugged Ed because they struggled with Hector the first time they came - he was quite strong. "I definitely think it is the same people and they targeted my alpacas - they knew they were there - it's just hideous." She added: "I am terrified for my remaining alpaca, Wallace, and I want other people to take extra care and to know these people are around." Both deaths were reported to Thames Valley Police who confirmed they were investigating.